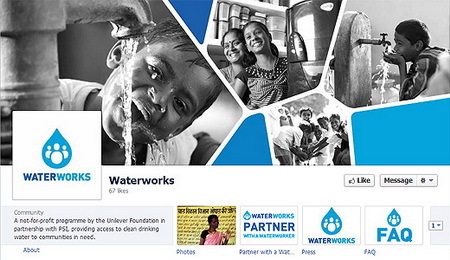 Unilever Foundation, the company’s nonprofit launched in the beginning of 2012 has teamed up with Population Services International (PSI) to commence a Facebook project, the‘Waterworks’ that is aimed to help millions of people in need of fresh water. The Facebook app I designed to connect about 900 million of Facebook users with around 800 million people that don’t have access to clean drinking water. Lots of these people die as a result of water deficiency and water-borne diseases like dysentery and diarrhea. Using Waterworks people can choose a daily donation, which can start from €0.10 ($0.13). The donations support educational programs run by Waterworkers within water-poor communities and distribution of water purifiers. Waterworkers are women close to those communities taught to educate people about health issues. These women are trusted to listen to compared to foreign workers and translators who often look suspicious to local people. They receive an income as well as training on communication techniques. Unilever and PSI start with training of 75 Waterworkers who will educate people in Bhopal, Madhya Pradesh, India. Unilever set the goal to provide safe drinking water by 2020 to 500 million people starting late 2010 when it launched its Sustainable Living Plan. Now, Unilever is 40 million people on its way toward its goal, says Ad Age. “So between now and 2020, I’ve got quite a lot to do to get to 500 million. I decided the only way to do this is to get to the masses … through charitable work. And we started discussions with Facebook to co-create this idea,” Unilever Global Marketing and Communications OfficerKeith Weed said.